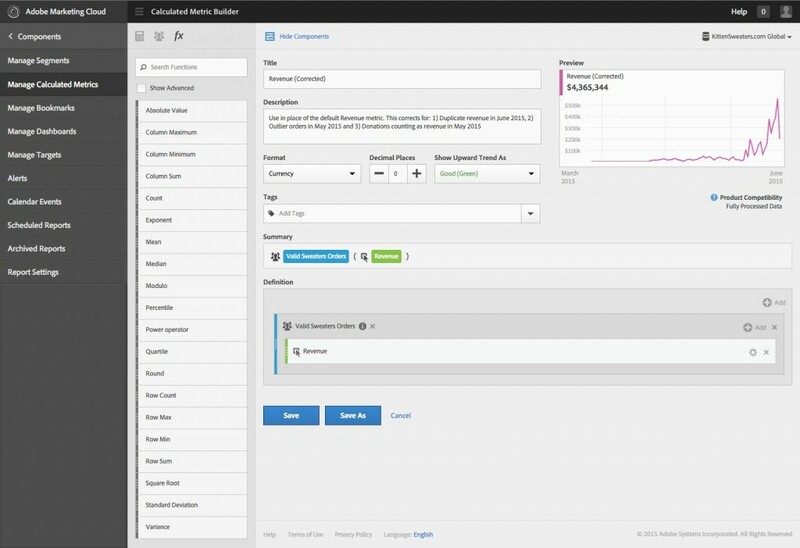 Few features were more hotly anticipated following Adobe Summit than the arrival of the newly expanded calculated metrics to Adobe Analytics. Within one week of its release, it is already paying off big time for one of my clients. I’m going to share a use case for how these advanced calculated metrics fixed some pretty broken revenue data. First, create a segment that is limited only to valid orders. You can test this segment by applying it on the current Revenue report and seeing if it fixes the issues. Historically, this would have been our only route to fix the revenue issues – layer our segment on top of the data. However, this requires all users to know about, and remember to apply, the segment. Let’s call our new metric “Revenue (Corrected)”. To do so, drag your new segment of “Valid Sweater Orders” into the Definition of your metric, then drag the Revenue metric inside of the segment container. 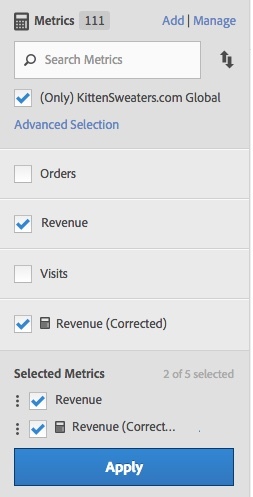 Now, the calculated metric will only report on Revenue where it matches that segment. Voila! A quick “Share” and this metric is available to all KittenSweaters.com employees. 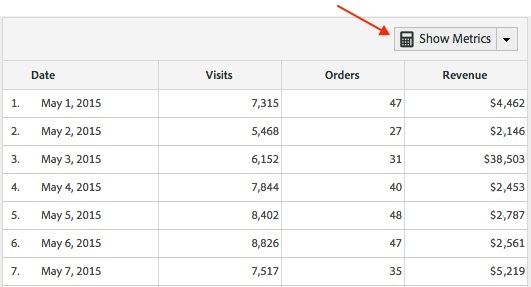 Now you’ll get to see the new Metrics Selector rather than the old, clunky pop-up. Select it from the list to populate your report. You can also select the default Revenue metric, to view the two side by side and see how your corrections have fixed the data. It’s a happy day in the KittenSweaters office! While this doesn’t replace the need for IT to fix the underlying data, this definitely helps us more easily provide the necessary reporting to our executive team and make sure people are looking at the most accurate data. Keep in mind one potential ‘gotcha’: If the segment underlying the calculated metric is edited, this will affect the calculated metric. 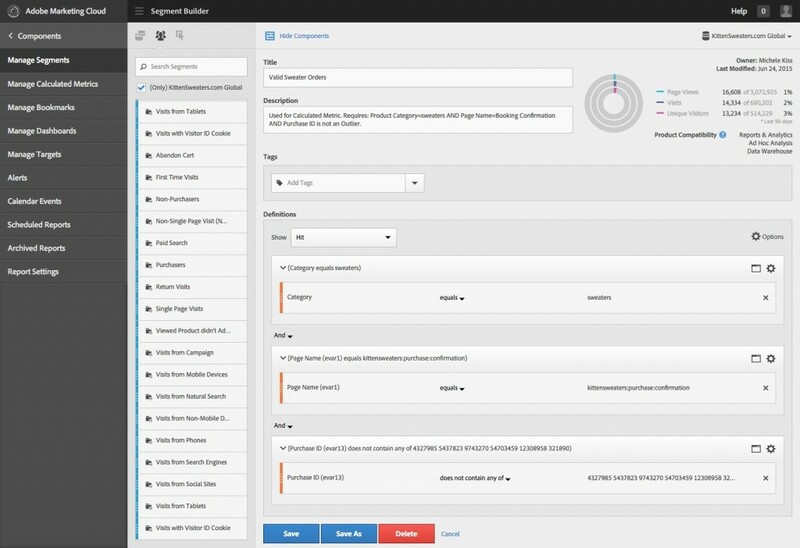 This makes life easier while you’re busy building and testing your segment and calculated metric, but could have consequences if someone unknowingly edits the segment and affects the metric. Share your cool uses of the new calculated metrics in the comments! If you haven’t had a chance to play around with them yet, check out this series of videos to learn more. 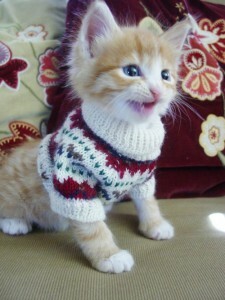 * Obviously KittenSweaters.com isn’t actually my client, but how puuuurrfect would it be if they were?! Whoa, a segment inside a calculated metric? That’s amazing…so many uses for resolving niggling data quality issues. Do you foresee any applications for resolving pesky spambot or ghost referral traffic inflation? Many chilly kitties thank you! If I am looking at the right bug you mention at the top, it is scheduled to be fixed tomorrow (Thursday, 7/16). Take a look after the maintenance release tomorrow, and you can update this post if everything looks good. Yep, it was fixed on Thursday and I just updated the post to remove the disclaimer. Thanks Jordan! You could definitely use for those types of purposes, Lea. Super handy! !